Nepal is a promising Asian country to run a VoIP termination business. The penetration level of mobile communication has reached 106% and continues to grow steadily. Large amounts of international GSM traffic are flowing here, which makes it possible to earn well on terminating calls. To successfully terminate in Nepal, it is important to have a high-quality Internet connection. In Nepal, The Internet penetration is 33.1%. In 2016, the fiber optic cable was laid in the country, which contributed to a reduction in the cost of Internet access services. In Nepal, the popular wireless connections are EVDO, WiMAX, and 4G. The average data transfer rate in the country is 2 megabits per second. The fastest Internet is available in the capital - Kathmandu. Note that there is a significant difference between coverage in large cities and in underdeveloped rural areas as in large cities, you can connect to high-speed Internet (5-10 Mbps). 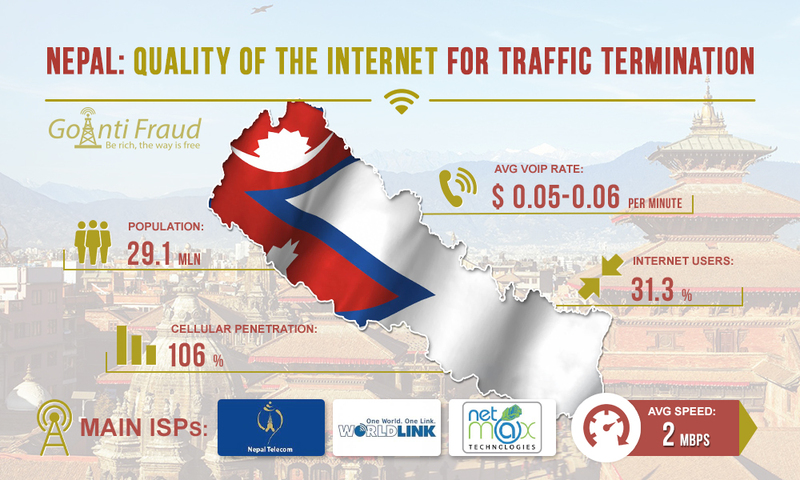 The average ping in Nepal is 42 milliseconds, which is considered an acceptable indicator for successful termination. The cost of an unlimited Internet services package that provides up to 5 Mbps is about $25 a month. To improve network bandwidth and save on Internet payment, use the GoAntiFraud traffic optimization module SBO. It allows you to "compress" traffic packages, without sacrificing voice communication when you are terminating calls. We bring to your attention a selection of videos about GSM termination, which will be useful for beginners and professionals! On our YouTube channel, we have collected up-to-date information on the telecommunications business, expert advice, step-by-step video instructions for working with GoAntiFraud and other useful materials. All this will help you increase the efficiency of termination and make more money! Do not forget to subscribe to our YouTube channel to regularly receive brand new videos about VoIP termination.